The trends in website design, just like fashion trends, come and go. Occasionally, necessity (like responsive design) dictates these trends. The new trends are industry shifts, like the transformation from flat design to skeuomorphism. The base to follow a trend must rely on the requirements of your business and your users. It never based solely on “what the leading sites are doing”. The site that only builds on trends rapidly turns out-dated. Hiding everything under a hamburger menu- Since the mobile devices became a commonplace, web designers have started simplifying the navigation and concealing it under a hamburger menu. This sort of trend also crept into the several desktop versions of websites. Account registration- You will explore this trend whenever you attempt to register for a site. There may be a form to fill out or a button that enables you to make use of a social account to sign up. The multi-step form wizards are likewise effectual as they “hunk out” the desired fields, lessening fields and empowering users to run through the process. Parallax scrolling- You have seen several sites that utilize parallax designing. It facilitates the background and foreground content to scroll at distinct speeds, making a chimera of depth. It makes an appealing effect to lure users via storytelling and you can take off a multi page site by breaking the scroll into sections. Card layouts- Initiated by Pinterest, you can explore cards everywhere on the internet as they provide information in bite-sized chunks ideal for scanning. Each card has its own unified concept. As they act as a “content containers”, their shape turns them easier to re-arrange for distinct device breakpoints. 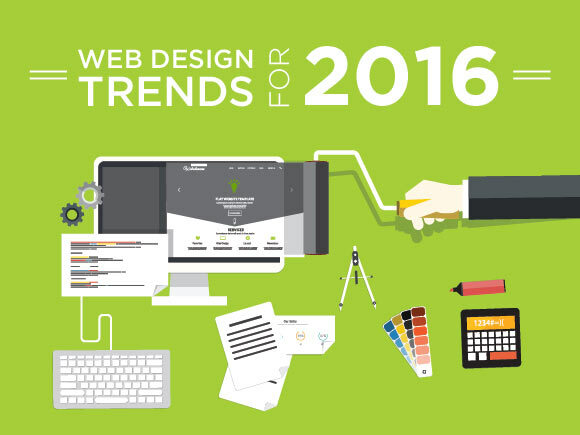 In 2016, the theme in trending design is a big drama. It holds great art, appealing story and plenty of planning to apply such techniques as they solely focus on grabbing users with instant impression.